PREPARE TO BE IMPRESSED! ACT NOW, DONT WAIT UNTIL NEXT YEAR AND MISS OUT!!! 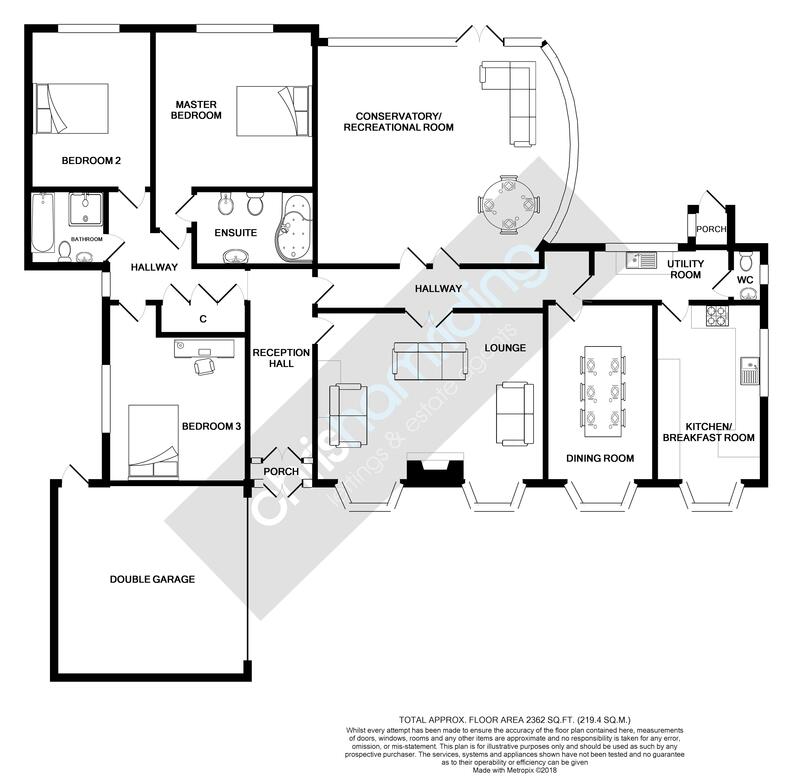 Briefly the property comprises: entrance porch; reception hall; hallway to living areas; hallway to sleeping areas with large built in storage cupboards; lounge; conservatory/ recreational room; dining room; kitchen/ breakfast room; utility room; WC suite; rear porch; master bedroom with en-suite luxury bathroom; Bedroom 2; bedroom 3 with built in home office area; family bathroom; attached double garage; garden areas to all sides with front and side driveway, formal rear garden and yard side garden; PVC double glazing; gas central heating. 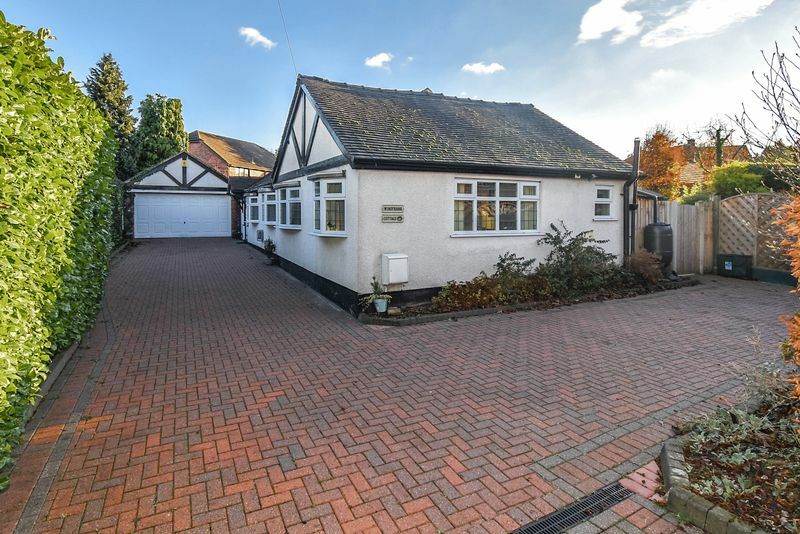 A generously proportioned detached bungalow, with a very pleasing layout which celebrates the luxury of space, and high specification accommodation which meets the selective demands of modern day purchasers. 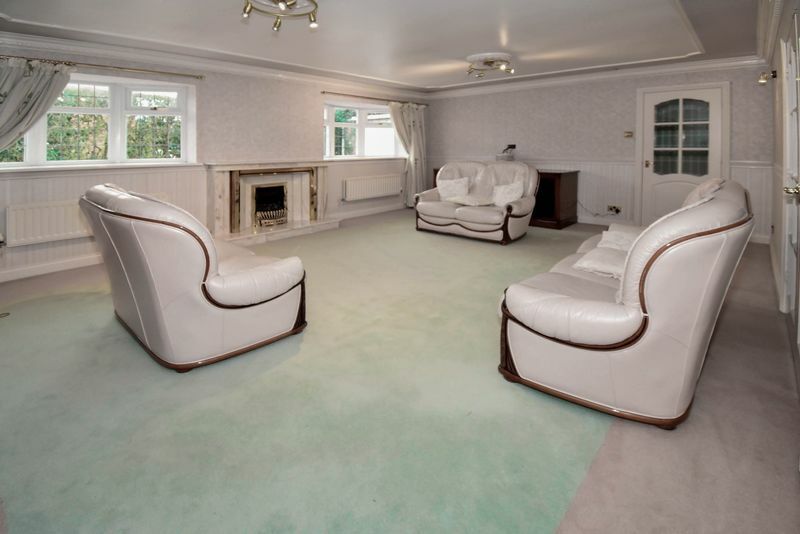 This much loved property was significantly developed by the current owners who have created a luxurious and comfortable property and interior. 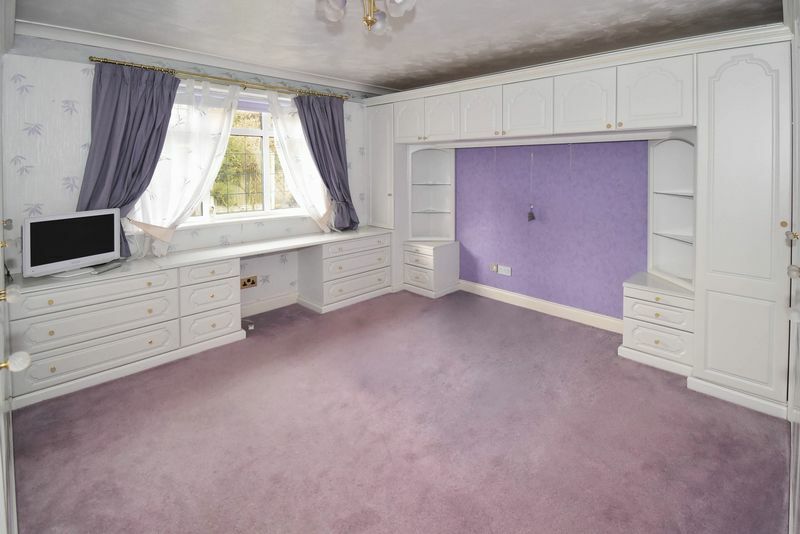 All the principal rooms are very pleasing sizes and essential additional specifications added to complete the home. 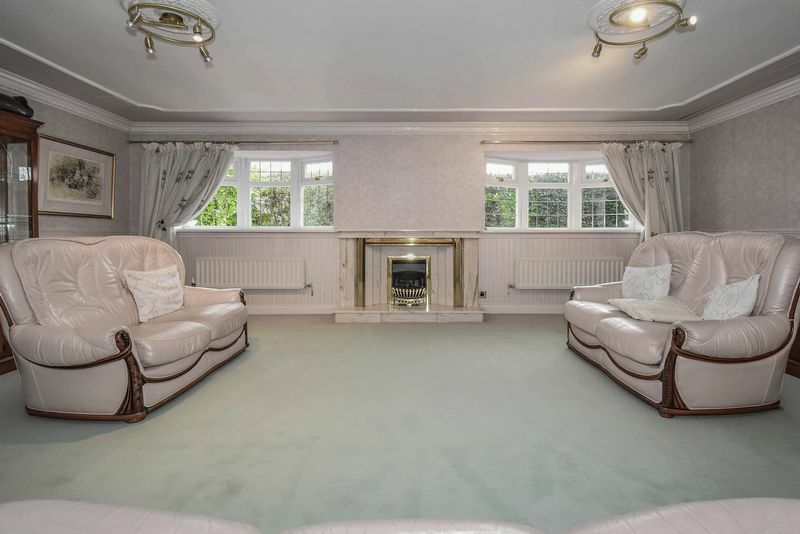 The home boasts well balanced living and sleeping areas, with a large lounge and huge conservatory/ recreational room, dining room plus three double bedrooms. 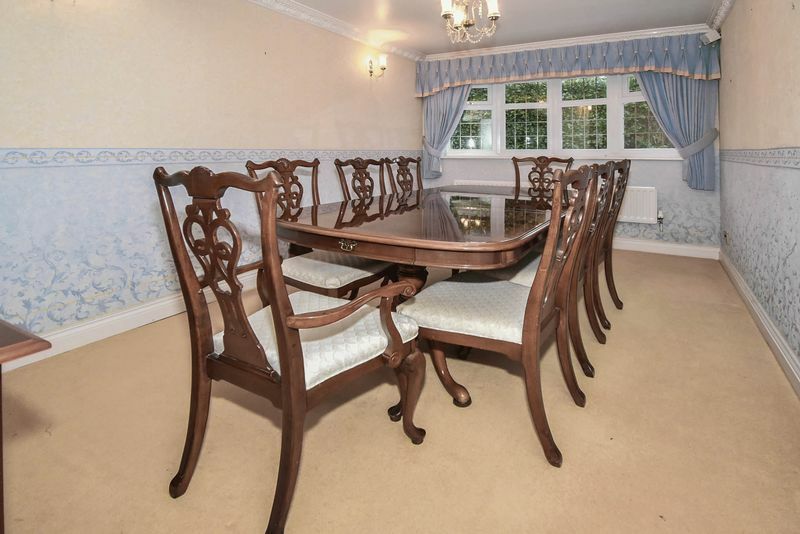 The dining room and kitchen/ breakfast room sit next to each other in the home, and offer the potential to create an open plan dining kitchen which would measure approximately 18' x 15'. The master en-suite bathroom is large and features a luxurious bathroom suite with a whirlpool style spa bath and integrated multi-jet shower cubicle. 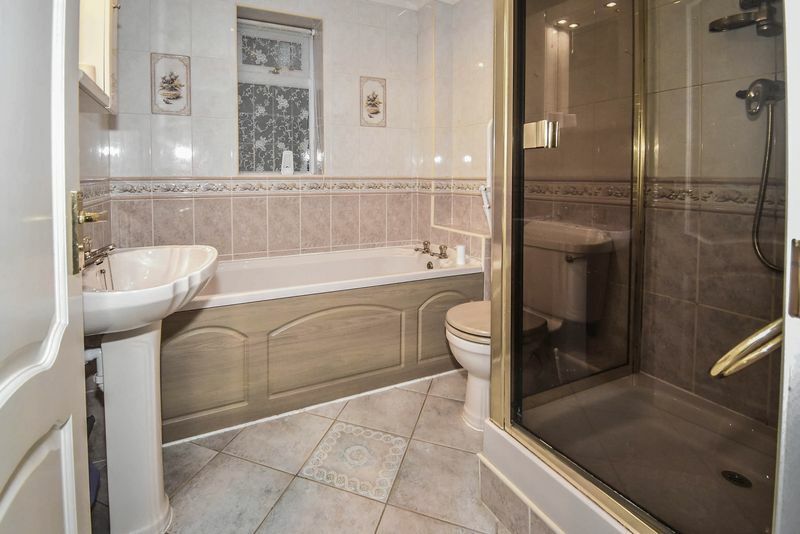 The family bathroom is four-piece featuring both a bath and shower. 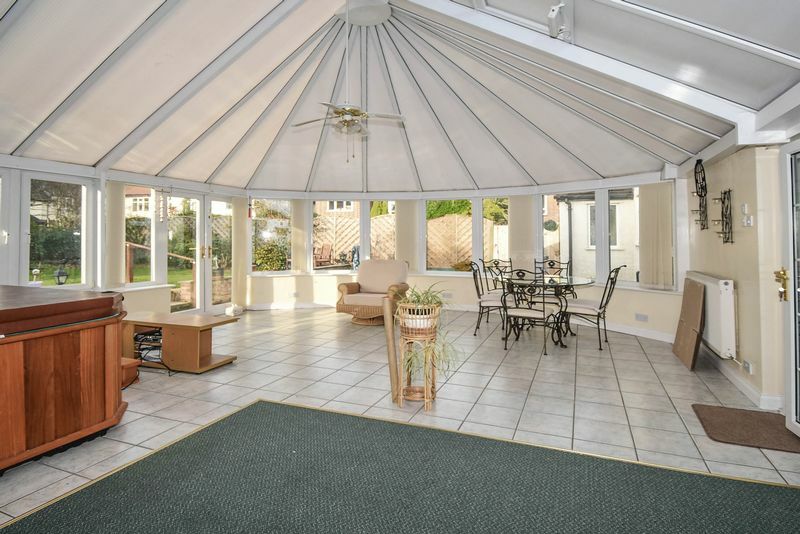 The conservatory/ recreational room is immensely impressive measuring some 23' 4'' x 20' 1' and with a lofty ceiling height reaching up to around 13'. The room features a wide sweeping barrel bay window at the side and the rear incorporates French doors opening out to the rear garden. 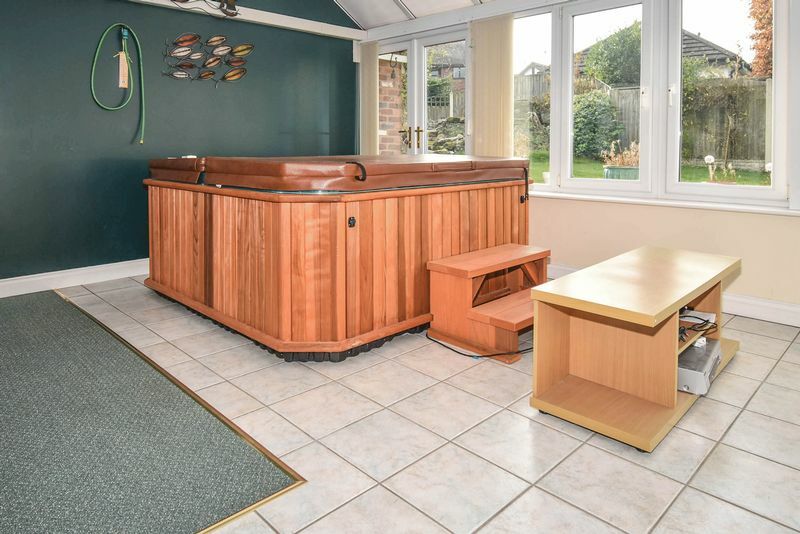 Built for fun and relaxation, the room incorporates a quality hot tub spa and an integrated corner gymnasium, plus plenty of space remaining for both living and dining or anything else! 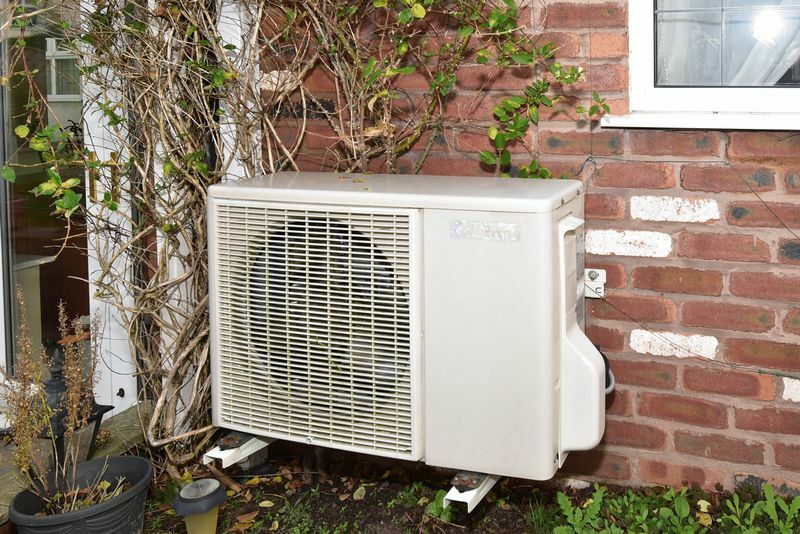 In order to aid all year round use of the room, a Worcester air conditioning unit has been installed which both heats and cools. A room like this takes entertaining to a whole new level! 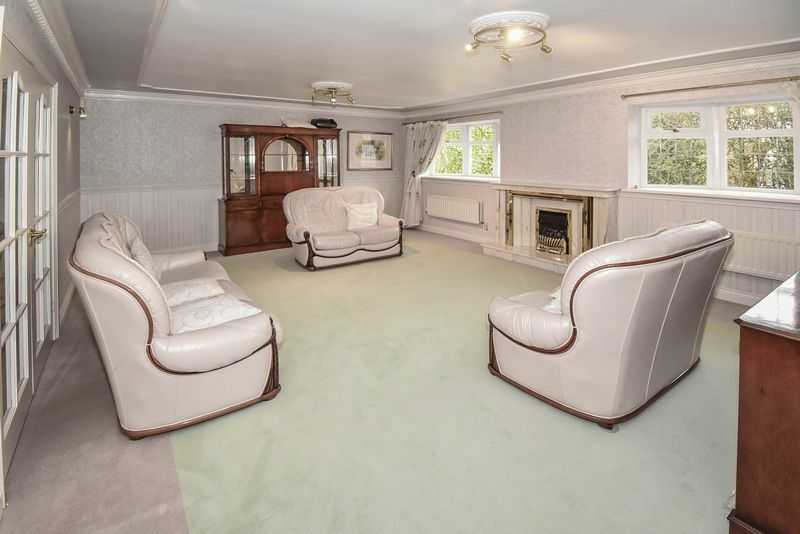 The property is set out intelligently too. A spacious central reception hall branches off in opposing directions. The front hall serves access to all the living areas, and the rear hall features a large amount of valuable built in storage and serves access to the sleeping areas. All the bedrooms feature comprehensive built in furniture, with bedroom three featuring a quality built in mini-office suite. 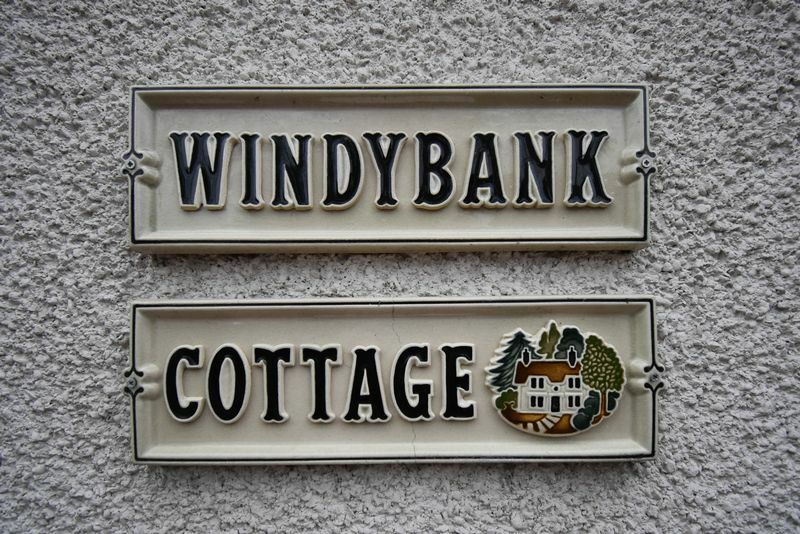 The accommodation really is uncompromising and delivers a comfortable and impressive standard of living. 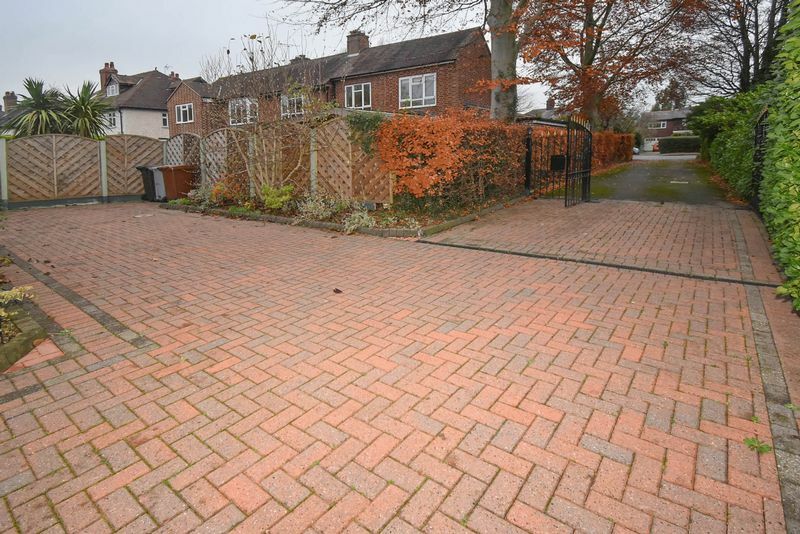 The property is addressed as Newcastle Road which does suggest that the property is road facing. The property actually sits behind the main building line, discreetly positioned 130’ (approx.) back from the road. A 170’ (approx.) long driveway sits at the front property and serves access to the attached double garage, and a side drive branches off with a separate 25’ (approx.) parking/ turning area. Electrically operated ornamental metal gates control access and intercom entry communication is facilitated from within the home. The rear garden is some 70’ (approx.) 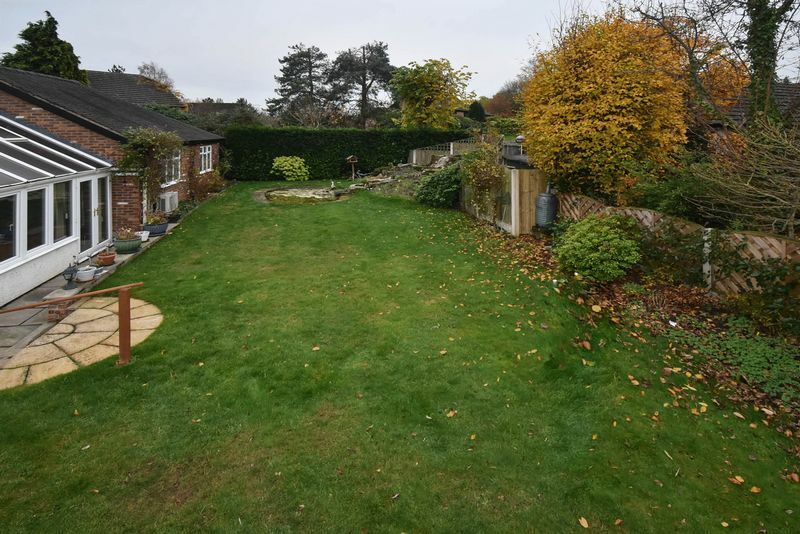 in length and features a patio BBQ terrace adjacent to the conservatory, a level lawn, ornamental pond with cascading rockery waterfall feature and there are stocked borders of much maturity. The location is excellent. 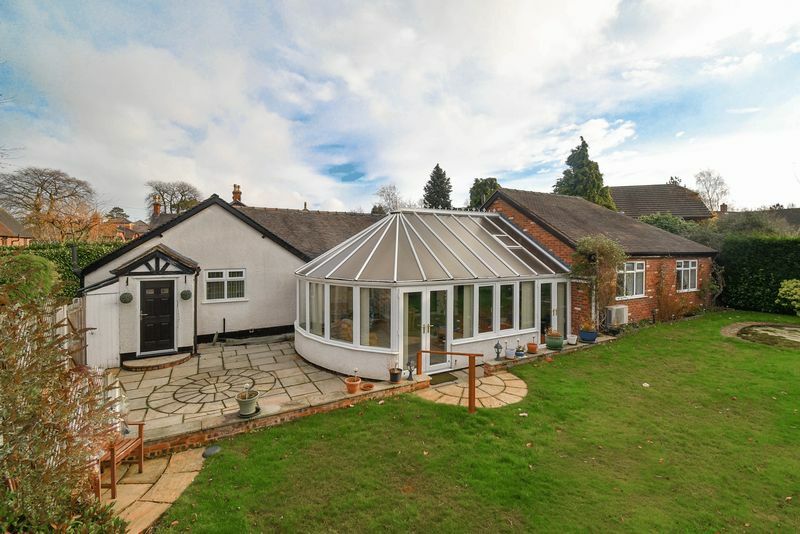 West Heath features some valuable infrastructure such as a choice of excellent reputable schools, a fantastic local shopping centre with restaurants, a local mini-mart Tesco store and the very popular Astbury Mere Country Park which is within easy walking distance of the home. 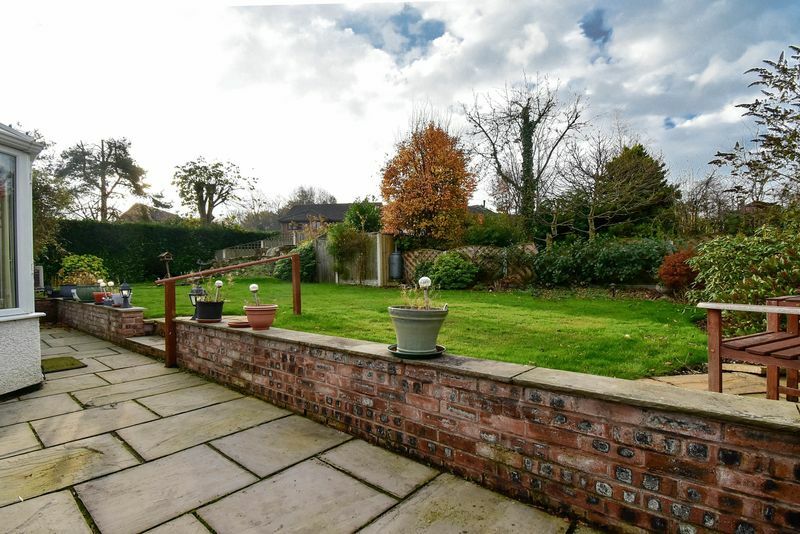 The position is also close to Congleton Town Centre and Retail Park and allows easy access to all major routes including the A34 and M6. 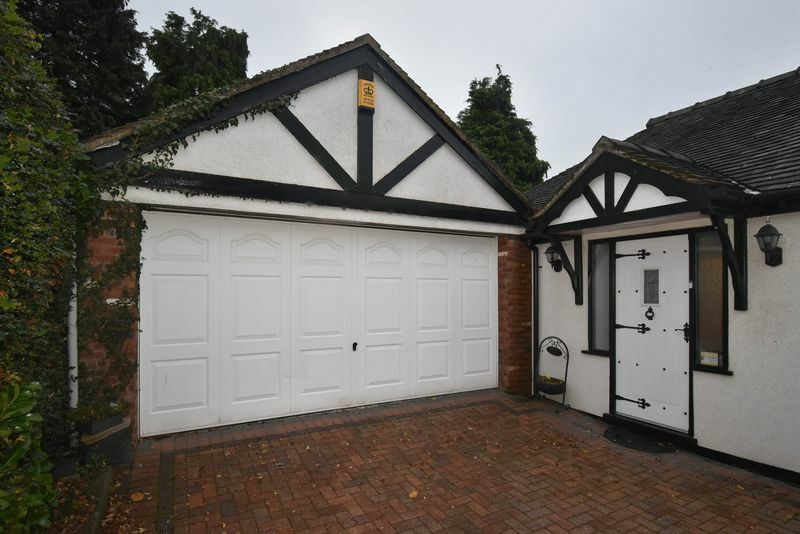 Feature timber double glazed external door with ornamental bevel cut glazing inset. Frosted double glazed side panel windows. Matted flooring. Frosted glazed French doors opening to the reception hall. Spacious reception hall with ornamental ceiling cornice and rose. Bevel cut glazed internal doors to the lounge and living areas rear hall. Open to the sleeping area inner hall. Central heating radiator. Decorative ceiling cove. Intercom gate entry system. Two wall light points and ceiling arch. Bevel cut glazed timber French doors to the lounge. Twin PVC double glazed doors to the conservatory/ recreational room. 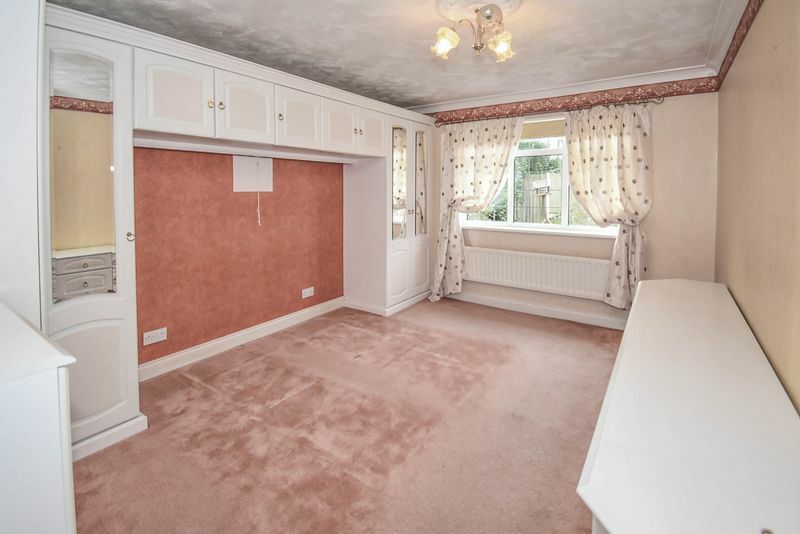 Attractive internal doors to the dining room and utility room. Twin PVC double glazed box bay windows to the front aspect. Beautiful polished marble fireplace with gas fire inset. Two central heating radiators. Ornamental ceiling cornice and roses. Two wall light points. Media projector screen flush fitted in to the ceiling with projector included in the sale. 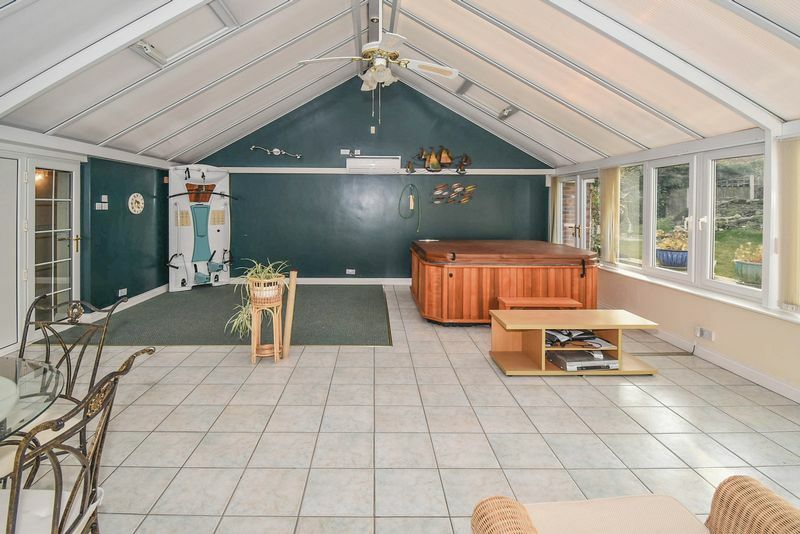 Impressive vast room designed for fun. PVC double glazed windows and external French doors opening out to the rear garden. Tall pitched ceiling with two motorised skylights. 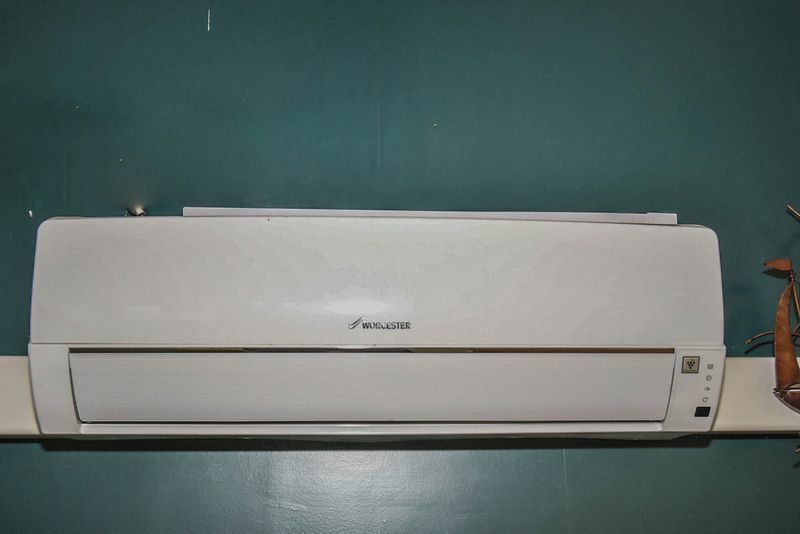 Worcester air conditioner unit which cools and heats. 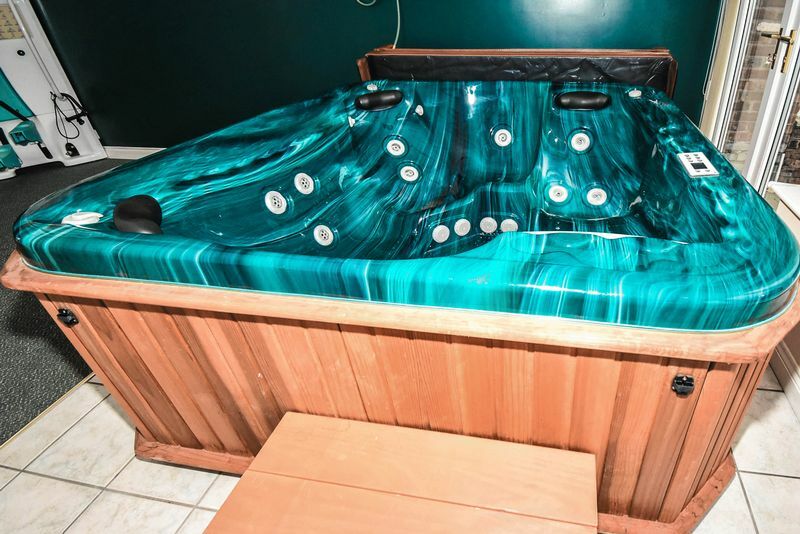 Built in corner gym and a superb quality hot tub, both included in the sale. Part tiled flooring. 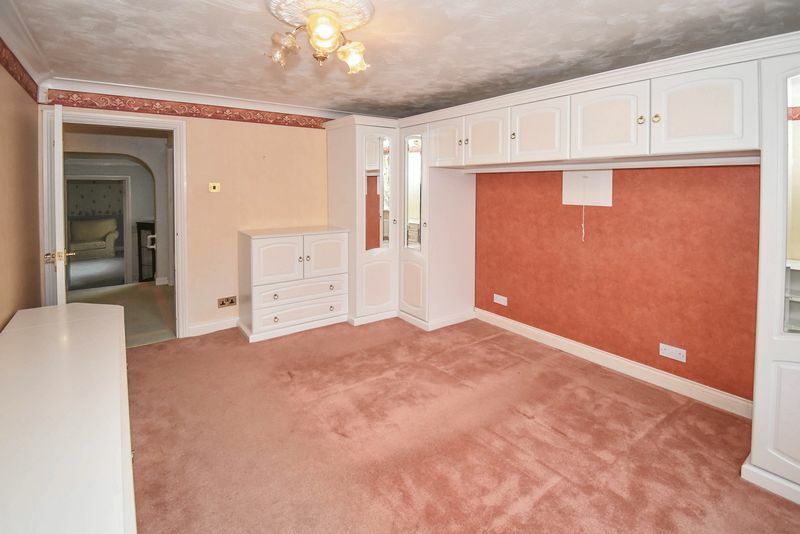 Internally plastered and decorated walls. Central heating radiators. Downlighting and wall light point. Lots of space for living and dining. PVC double glazed box bay window to the front aspect. Central heating radiator. Ornamental ceiling cornice and rose. Two wall light points. Multi aspect room with PVC double glazed window to the side and a feature PVC double glazed box bay window at the front. White gloss traditional style suite with granite effect work surfaces incorporating a breakfast bar. 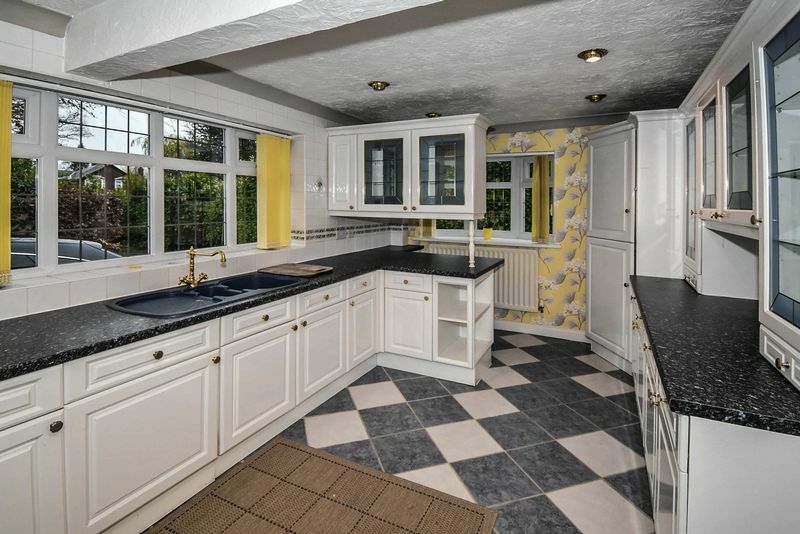 Details of the kitchen include: double oven; ceramic hob; fan; integrated dishwasher; sink with mixer tap; stone effect tiled floor; tiled splashbacks; recessed down lighting. PVC double glazed window to the rear. Utility suite matching the kitchen suite with a sink and space for a washer, dryer and tall fridge freezer. Tiled flooring and splashbacks. Central heating radiator. Access to the WC suite and rear porch. Frosted PVC double glazed window. 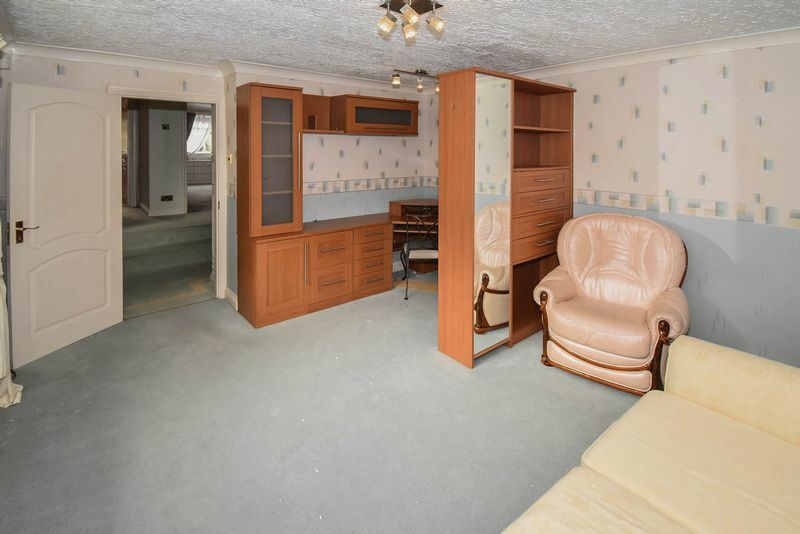 Suite comprising: WC; wash basin; tiled flooring and splashbacks; central heating radiator. External door to the rear garden. 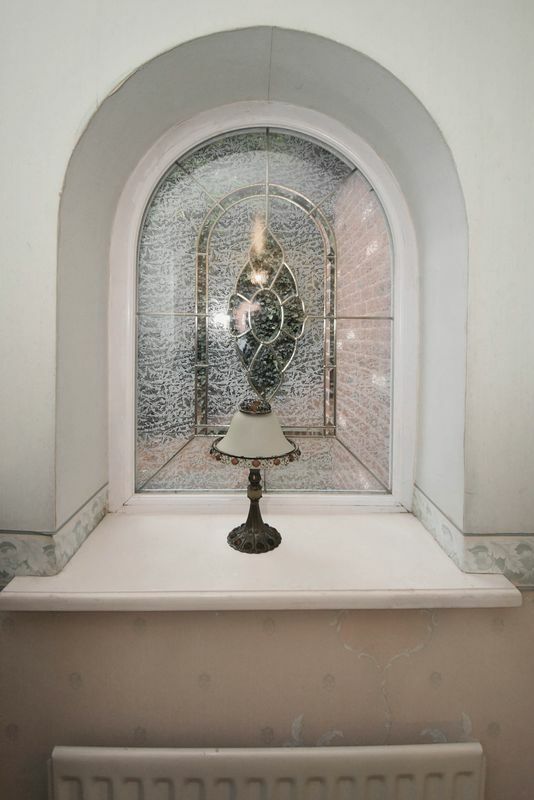 Feature arched ornamental double glazed window with bevel cut glazing inset. Central heating radiator. Tall and deep built in triple storage cupboards. Ornamental ceiling cornice. 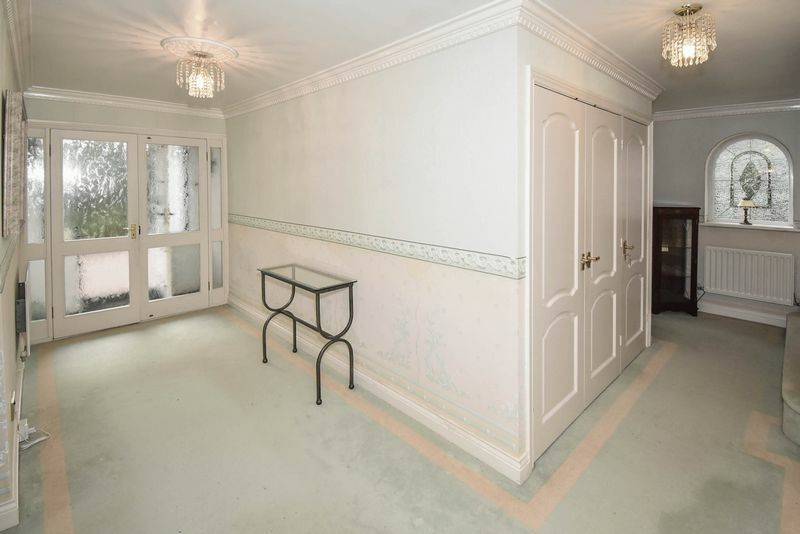 Attractive internal doors leading to the bedrooms and bathroom. PVC double glazed window to the rear aspect. 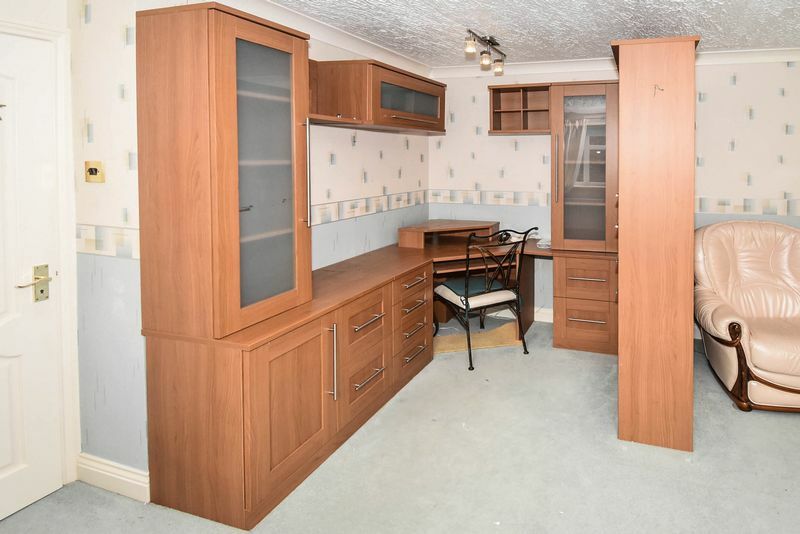 Comprehensive range of bedroom cabinets comprising: wardrobes with bevel cut mirror doors; over bed linking storage units; bedside cabinets; corner display shelving; drawer units and dresser. Central heating radiator. Luxury four piece bathroom suite comprising: white gloss storage cabinetry housing a back-to-wall bidet, concealed cistern button flush WC and wash basin; deep whirlpool bath with integrated curved glazed shower cubicle having overhead drench shower, hand held shower on a riser rail and multi body jets; fully tiled walls and floor; ladder heated towel radiator; recessed ceiling down lighting. PVC double glazed window to the rear. 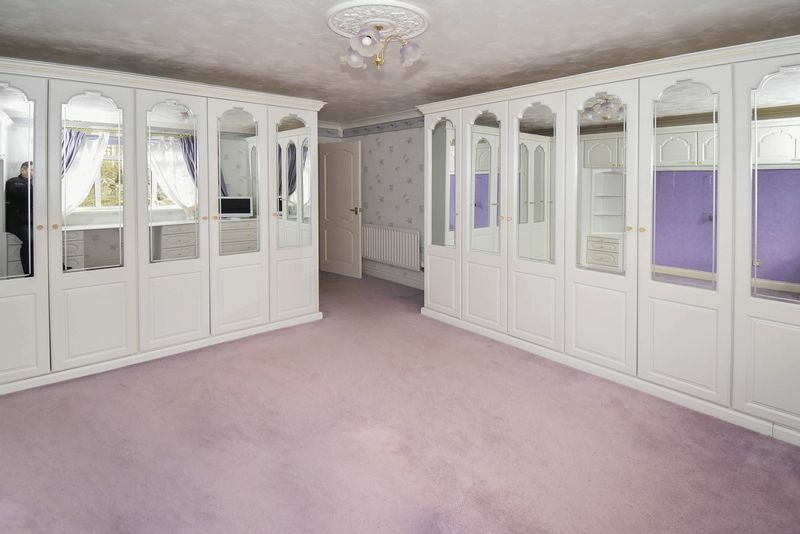 Built in cabinetry comprising: wardrobes with bevel cut mirror doors; drawer storage units; dresser; over bed linking storage unit. Central heating radiator. Ceiling cove. PVC double glazed window to the side. Central heating radiator. Quality built in office suite. Ceiling cove. Frosted PVC double glazed window to the side. 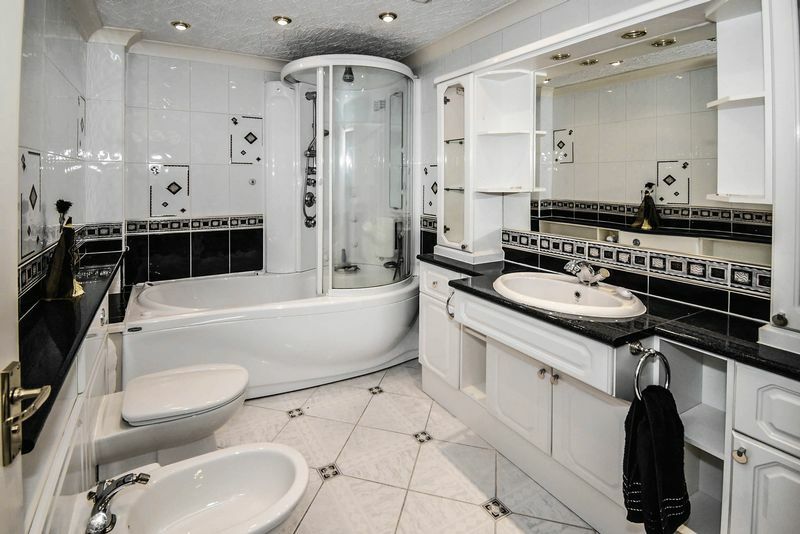 Four piece suite comprising: panelled bath; WC; pedestal sink; separate shower cubicle with glazed screen/ door and thermostatic mixer shower; fully tiled walls and floor. 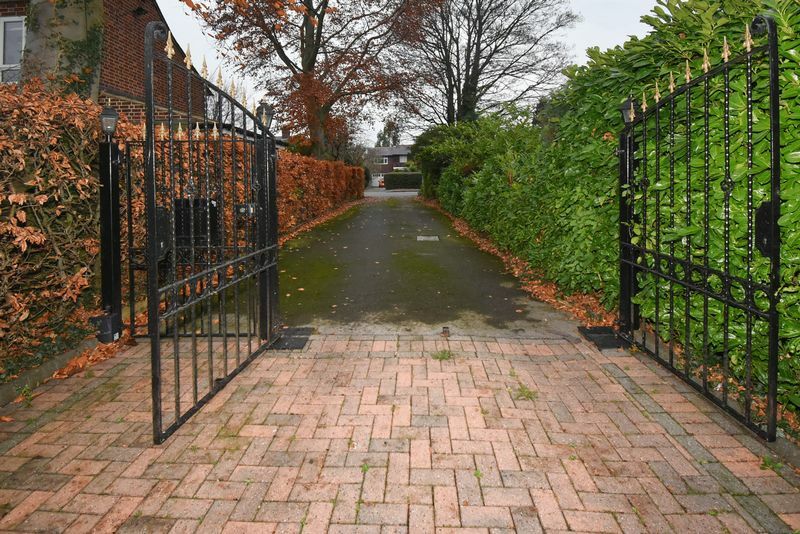 Approach driveway leading up to electric ornamental gates and a personnel gate with intercom access. 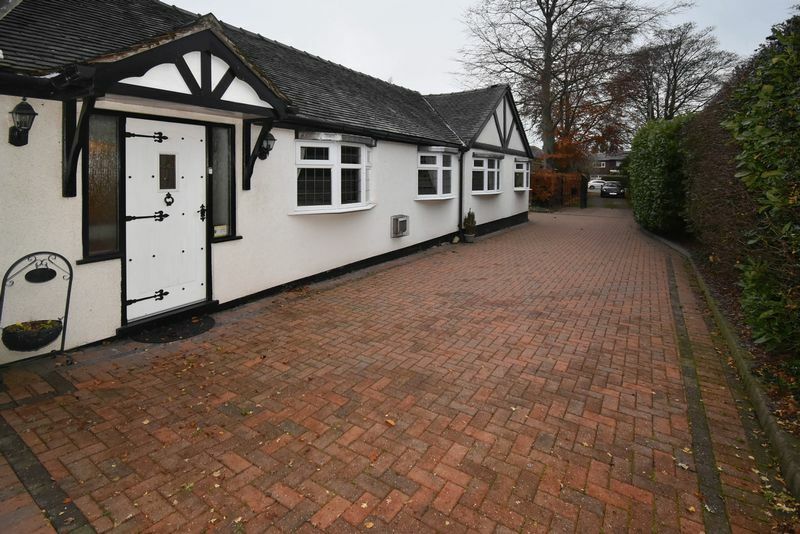 L shaped block paved driveway incorporating a turning / parking bay at the side and terminating at the attached double garage. 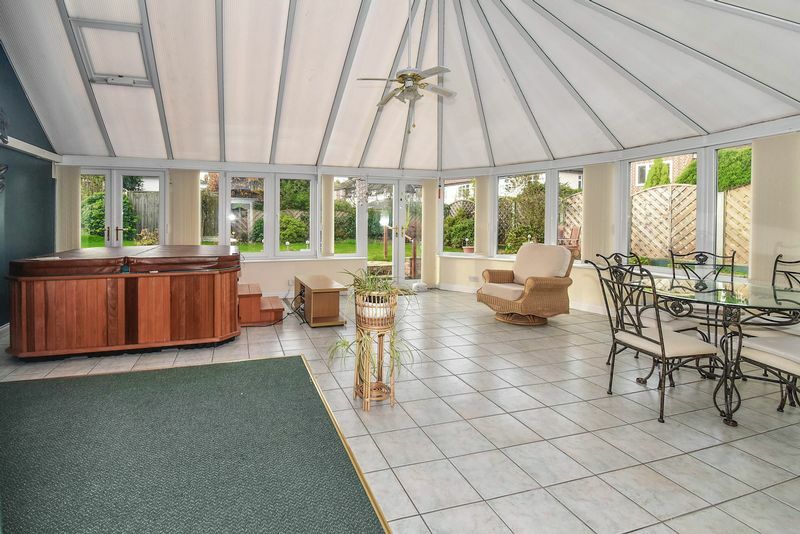 Long rear garden with a patio entertainment area adjacent to the conservatory, plus lawned garden with mature stocked borders. Ornamental pool with cascading rockery waterfall. © Chris Hamriding. All rights reserved.